Bruce Lee himself often used to comment on how he trained his abs. In doing so he helped other people build their own. Bruce learnt how to build abs from champion bodybuilders, and spent many years perfecting the art of abdominal development. He believed that the abs were vital to provide balance and strength in the body. “The abdominal and waist region coordinate all parts of the body and act as the center of generator. Therefore, you can promote the ability to control the body’s action and master your will more easily.” Bruce Lee. One of the best tips that he offered, which has been tried and tested many times over the years, is that you should always curl your body up as if rolling up a newspaper when doing a crunch. Do not sit up and down like a see-saw, but curl your upper body up starting with your head, then neck, then chest. Keep your abdominals engaged (tensed) and your attention focussed on them at all times. Do not simply go through the motions. Lee concentrated on five exercises for stomach and abdominal development. He found that these were the best exercises to help build and maintain perfect six-pack abs. He would also only perform 1-3 different exercises on any one day, and very rarely perform all five in the same session nor on the same day. It is important to work fast while concentrating on good form. When you can no longer perform any more full repetitions, continue with smaller movements, such as abdominal crunches, which give improved muscle development and definition. Bruce Lee was also a firm believer in static concentrations, which involve tightening the stomach muscles for short bursts and then relaxing. Most importantly, Bruce Lee taught that abdominal exercises never reduce the waist, i.e. there is no reduction in belly fat. For this, diet and nutrition is key. Bruce Lee further developed this routine, adding additional sets of sit-ups, side bends, leg raises, “flags,” twists and back bends to his abdominal workout regimen. The “flag” exercise was a complex movement that Lee devised for working the abdominals harder. While lying on a bench, he would grasp attached uprights with both hands and raise himself, supported only by his shoulders. Then, with his knees locked straight and his lower back raised off the bench, he would perform leg raises. Bruce Lee preformed both cardio and weight training (high and low intensity) every single day. In doing this he lost a lot of muscle, but mainly he burned off fat. This was the main reason that his abs looked so good. There was barely a shred of fat covering them. Bruce ate a good diet and a lot of protein. He was an advocate of eating a post workout protein shake and used to experiment with lots of different ingredients. Recent research has proved that post workout shakes drunk within 30 minutes of exercise provide maximum benefit. Lee firmly believed that proper nutrition was essential for developing the perfect set of abs. What you eat determines the thickness and density of the outer tissue covering the abdominal muscles. Once the belly fat has been worked off through a calorie controlled diet combined with aerobic and endurance fitness training, the abs are then relatively easy to maintain through a good healthy diet and regular abdominal exercising. He did a lot of martial arts and was especially adept at kicking. Lots of the muscles used to power a kick come from the core region and as such he worked his abs out in different ways. He was constantly changing his abs routine, which meant that his abs never become too efficient at performing the same exercise. Overall this all helped him to achieve a very complete development. Bruce Lee’s final advice is to exercise abs daily, and that with patience and perseverance, results will be seen in time. This advice goes against what many athletes and bodybuilders advise. Today people suggest that you treat your abdominals as any other muscle and ensure that it is rested for at least 2 days after exercising. This was by no means Bruce Lee’s only workout and weight training routine, but it formed the foundation, the core, of his strength training later in his career. If you want to start to train like Bruce Lee then perform the Bruce Lee Workout at least once per week. For Bruce Lee stretching was a vital component of his daily fitness routine. The same rule really applies to all forms of exercise, from martial arts to track and field, weight lifting to gymnastics, plus sports from cricket to NFL. The benefits of stretching are numerous and can aid you for years to come. Stretching helps to prevent injury while training and competing and also increase range of motion, which can increase the work and benefit of exercising. For many martial artists stretching is just about kicking higher, but really stretching plays a more important role than just that. According to Herb Jackson, one of his training partners, stretching was the only set routine that he performed before a workout. His workouts were often varied and spontaneous, but the stretching was specific and regimented. He also was famous for stretching almost constantly while working on set. People have commented that he would be reviewing some footage and rather than sit, would stand with one leg up on a chair to help keep himself loose for the next scenes. To view one of Bruce Lee’s stretching routines, watch his film Way of the Dragon. In the final act, before fighting Chuck Norris on the Roman Coliseum, he performs one of his pre-fighting warm up and stretches. Unlike many other action movies, what Bruce displayed on film was true to his methods. Stretch for improved health and fitness. Strong and supply joints are essential to being healthy and fit. Reduce injury. A greater range of motion means that you are less likely to put the weakest points under too much strain when working out or competing. Ideally you should stretch for 10 to 15 minutes before your main workout, but after warming up. As part of a stand alone fitness regime, you should aim to stretch 4 times per week to help strengthen and tone the body. Pilates and yoga can be considered advanced forms of stretching for this purpose. When stretching, you should apply constant gentle pressure that increases over time. Do not bounce. Always relax into the stretch. When doing seated forward stretches look forwards, not down, to avoid hunching the back. Lower Back Stretch – vital stretch to warm up the lower back before exercising. In addition to stretching muscles, it is also wise to “limber up” before exercising. This involves loosening the muscles with small gentle exercises. Typically the neck, shoulder, wrists, knees and ankles are limbered up and gentle stretched. This helps to get the blood flowing and warm the tendons. “From Icon to Lifestyle, the Marketing of Bruce Lee” A New York Times piece on Bruce Lee. Bruce Lee was a trend setter in many ways. He was the first celebrity to really bring the idea of martial arts fitness training into the lime light. Even today people want to know how he managed to develop a body that was almost perfect. His book, The Art of Expressing The Human Body, tells this story. Beyond his martial arts and acting abilities, Bruce Lee’s physical appearance and strength were truly astounding. He achieved this through an intensive and ever-evolving conditioning regime that is being revealed for the first time in this book. 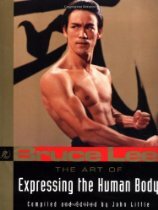 If you want to look like Bruce Lee, the Bruce Lee’s The Art of Expressing The Human Body is ideal as it details many of his training methods and his diet and nutrition rules. Much of what we know about Bruce Lee is found in this one book. In this book we can learn about the various methods Bruce Lee used throughout his career. He changed his methods as his body developed. He moved from traditional kung-fu training drills to incorporate more functional strength training. We can also learn about his diet, with insights from Linda Lee on what he liked to eat, the supplements he took, even the home made juice blends that he drank. One of the most inspirational things about this book is that it shows his actually training logs. Bruce Lee was a great believer in documenting all his training. He believed that only by keeping a log of his workouts was he able to progress and improve. Strength training is a key feature of the book. Bruce loved isometric exercises, and the book explains how they provide the raw strength required for martial arts. And he developed isometric exercise far beyond the basic horse stance. Obviously the book documents his famous 1 inch punch, and goes some way to explain how he trained his body and his mind to enable him to accomplish such feats. Part of his success was trying new techniques, even having fitness equipment custom made to meet his requirements, to strive to improve his physical self. There are whole workouts dedicated to wrist and forearm strength (essential for martial artists and grapplers). Plus his back exercise routines are simply awesome. He provides details on stretching too. The Art of Expressing the Human Body is still as relevant today as it was when Bruce Lee started penning his notes in the early 1970′s. Modern day martial arts classes would not be as dynamic today if it were not for Bruce Lee, and what he taught to others through his classes, and through his books. Every serious martial artist should read this book.